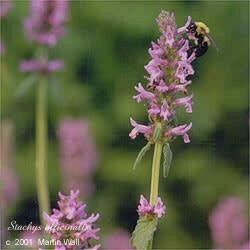 The genus name Stachys is an ancient Greek term meaning "spike," in reference to the way the flowers grow. The name betony is thought to derive from the Latin vettonica, a reference to the Vettones, a people who inhabited a part of the Iberian Peninsula in ancient times. Betony could also derive from the Celtic bew, "head," and ton, "good," in reference to the herb's use for ailments of the head. A perennial native to Europe, Asia, and northern Africa, wood betony grows in shady woods where lime is present in the soil. It has a tall, hairy stem and rough, fringed leaves. The two-lipped flowers range in color from pink to purple and bloom in whorls from short spikes. The spikes have the unique quality of having a break in the flower rings, so that the spike is interrupted. Wood betony has long been held in high regard, as evidenced by the Spanish compliment, "He has as many virtues as betony," and the Italian saying, "It is better to sell your coat than be without betony." The ancient Anglo-Saxons wore wood betony as a protective charm. Wood betony breaks up chi stagnation, relaxes the nerves, and relieves pain. One of its constituents, the alkaloid trigonelline, has been shown to help lower blood sugar levels. Wood betony is used in the treatment of alcoholism, allergies, anxiety, asthma, catarrh, colic, diarrhea, dyspepsia, drunkenness, edema, exhaustion, fear, flatulence, gout, headache, head cold, hearing loss, heartburn, hyperactivity, hypertension, hysteria, indigestion, insomnia, kidney dysfunction, migraine, neuralgia, nightmares, rheumatism, sore throat, stress, varicose veins, vertigo, worms, and worry. Topically, wood betony can be applied to wounds to stop bleeding and prevent scarring. It also can be used as a poultice to draw out splinters and boils and to treat varicose veins. As a mouthwash and gargle it can be used to treat sores, sore gums, and sore throat. It was once used as a snuff and smoke to treat headache; because the snuff was apt to cause sneezing it dispelled congestion in the head. The young shoots and leaves of all Stachys species can be eaten raw or cooked. The fresh plant can be made into a hair rinse yielding golden highlights. It also can be used to make a yellow dye for wool. The dried plant has been burned as a purifying incense. Wood betony is generally regarded as safe. However, large doses may cause vomiting. Pregnant women should avoid large doses, except during labor, and then only under the guidance of a qualified healthcare practitioner. Do not confuse Stachys species with Pedicularis species, which are also known as betony, as their uses are not interchangeable.